I accidentally spilled some fresh cranberries on the kitchen floor as I was opening the package. Our dog, Xaxi, ran into the kitchen (her superpower is the ability to instantly appear in the kitchen as soon as something falls to the floor) like she does and licked up all the cranberries in seconds. I quickly shouted for Steve to look up whether cranberries are edible for dogs. It turns out they’re actually good for dogs and help prevent UTI’s just like in humans. So I gave Xaxi a few more cranberries. She absolutely loved them. I tossed them all over the apartment and she ran around chasing them as if I was throwing bits of fresh meat or something. I love when I find a new treat for her. I love to see her taste a food and decide weather she likes it or not. She’s a picky eater. She won’t eat apples but she likes pears. She hates cucumbers but loves zucchini and snap peas are her absolute favorite. 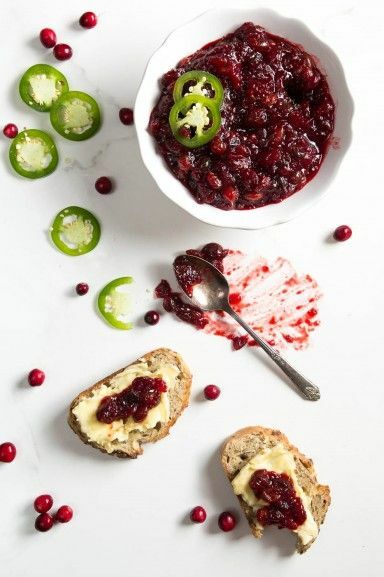 After playing with the dog for a while I made a sweet and spicy cranberry chutney with mustard seeds and jalapenos. 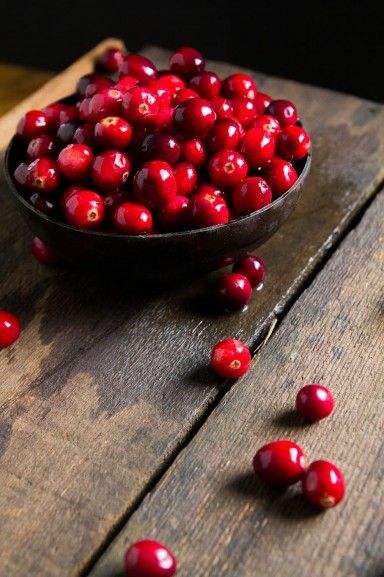 I love the Indian spices and flavors with the tart cranberries. I served it with some bread and cheese. It was really yummy! In a medium saucepan, heat ghee or oil until it starts to shimmer. Drop in one mustard seed to test the oil, if it sizzles, the oil is ready. Add the rest of the mustard seeds. Let cook for about 10 seconds. Add the onions and jalapeno slices. Cook until the onions soften and turn translucent. Add the bay leaf, black pepper and turmeric. Stir and cook for about 10 seconds. Add the cranberries, water, sugar and salt. Stir. Turn the heat up to high. Bring the cranberries to a boil. Once the cranberries boil, turn down the heat to low and let cook for 15 minutes. 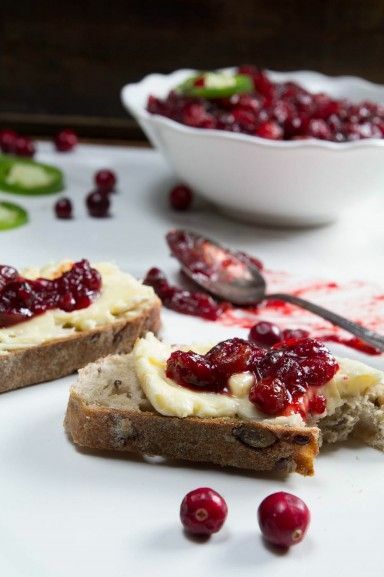 This cranberry chutney is great served with cheese. I ate a whole bunch of it with a big slab of camembert. Brie or goat cheese would be great too. It would also be great served along side a traditional Holiday meal or with a simple roast chicken. 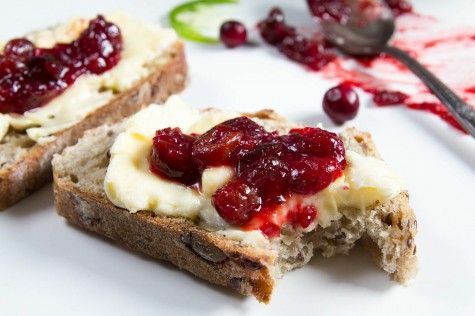 Comments on "Sweet and Spicy Cranberry Chutney"
Hello! I am making this chutney tonight and am very excited! I just wanted to say, you left the step out where you add the sugar. Thank you very much! Thanks for catching that! You add the sugar with the water and salt. I fixed it in the recipe. Hi there. Thank you for the recipe. 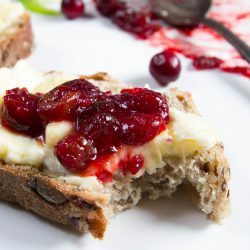 I'm interested in making this for Thanksgiving but have always thought chutneys to have a citrus component. Do the cranberries substitute the citrus or should I complement with something like oranges and orange zest? I have made this twice now - once for Thanksgiving (everyone LOVED it!) and the second time to spread over cream cheese for a New Years Eve appetizer. I realize this has been posted for a long time so you may not respond but was just wondering if you had any tips for not having mustard seeds flying everywhere when you add the onion/jalapeño?? Other than that minor issue, love the recipe!